I made a few cards this week. 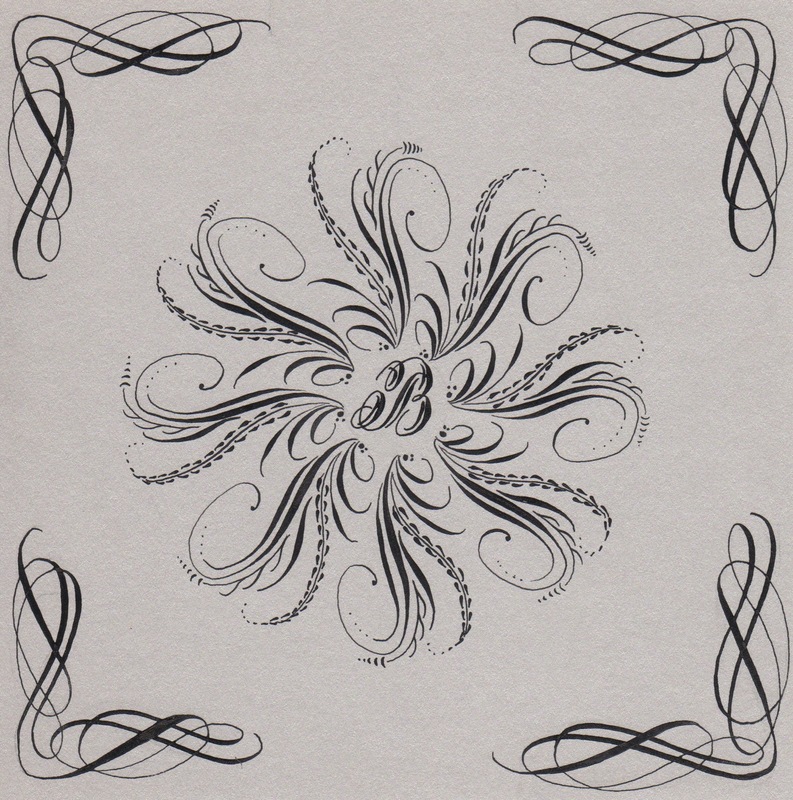 The above mandala was done with Moon Palace Sumi and a Zebra G. I wanted to add some corner flourishes. I'm not in love with these corners, but there are parts I'm in like with. :) More practice and refinement is needed. 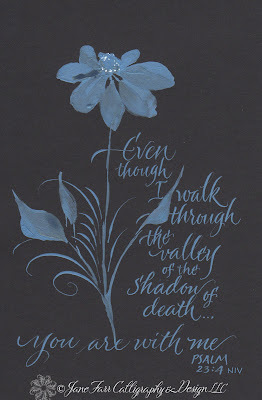 For the Psalm 23:4 card I used gouache, a flat brush, and a Hiro 700 nib. I went back over parts of the flower with the same color gouache mixed with Peal Ex powder. It still need something, so I added some touches of Dr. Martin's Bleedproof White to the center of the flower. 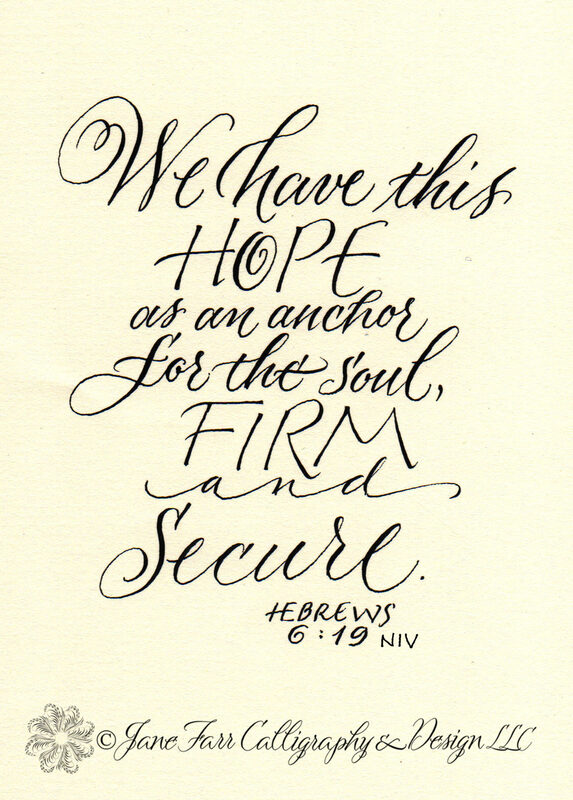 I am trying to be more disciplined about lettering bible verses. During my quiet time, I'm always jotting down scripture references which I intend to letter "someday." For this week at least, I actually followed through on a couple. Both Isaiah 54:10 and Hebrews 6:19 were done with Moon Palace Sumi and a Zebra G comic nib. Thank you all for your continued support of A Place to Flourish. I appreciate your comments and emails. I enjoy my wedding calligraphy business very much, but your support spurs me on to include other types of lettering in my daily life. Beautiful Jane! Love what you did with the Isaiah verse! Thanks for sharing your delightful work with us! I really like "Though the mountains be shaken . . ." It has a wonderful feel. Was it really done with a pointed metal nib? It looks like it could have been done with a pointed brush. Either way, lovely! 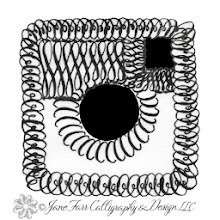 I've really gotten distracted or focused with tangling. But I have 2 possible jobs in the pipe in that will get me back to lettering. Have a grand weekend! Jane, these are all gorgeous!! I am totally in awe of your talent! 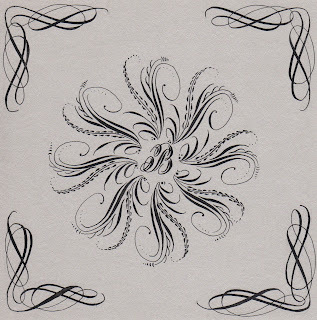 Always lovely...and I'd take those only-in-like corner flourishes any day! I love the Bible verses, Jane, very inspiring. The blue flowered one on black is truly wonderful. Jane the Isaiah verse seems so poignant to those of us over here and down under following the Christchurch earthquake. It also has a real sense of vibrancy and life to it - reminds us all of our resilience I think. Thanks! It always gives me a lift to visit you, Jane. I esp. love the drawn out / extended "and" on the second scripture verse above - and it fits the context so perfectly... it was a pleasant surprise. I admire your work! 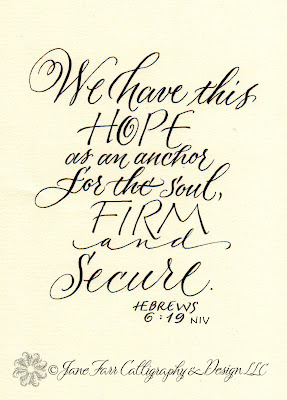 I love your Hebrews 6:19 piece. Will you be selling it on your etsy shop? Thank you for your comment and interest in my Hebrews 6:19 piece. Although not in my Etsy shop, I do have an 8.5" x 11" print available. You can send me an email by clicking on the "View My Complete Profile" above on the right and then clicking on the email link. I'll be happy to send you pricing and a sample image. I tried to post this Isaiah verse to facebook and couldn't. I just wanted to share your art of this verse. Do you have it somewhere to sell that I could post it? It's one of my favorite all-time passages! Thank you for your interest in my calligraphy, Joy. I've paid Zondervan (the USA copyright holder of the NIV) for permission to use this verse and any interested parties should email me directly regarding its use to prevent copyright infringement. Thanks! I appreciate comments and love to hear from my readers! I'm a calligrapher working out of my home studio. I have a passion for calligraphy and have an insatiable appetite for learning new things to incorporate with my lettering. I have reduced the amount of client work I accept, and as a result, my schedule fills quickly. Of course, you are welcome to contact me about my availability. If I am unable to do the work, then I am pleased to provide referrals. In addition to calligraphy, I enjoy journaling, traveling, baking, reading and watching Purdue University basketball. I am married to my best friend and we have two great kids. Feel free to email me about my work, but please do not take, download, or copy my work without my permission. Christmas in July SALE! - All classes are on 25% off starting TOMORROW through the end of the month. More information HERE Come on over and learn some fun stuff!